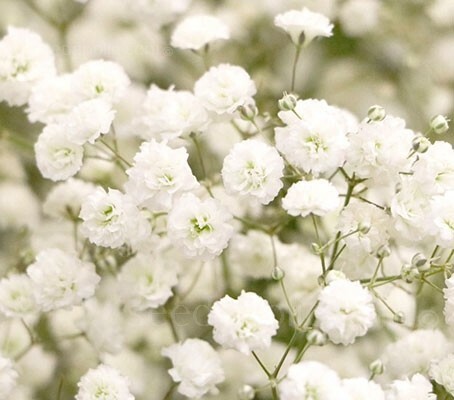 Gypsophila has been cultivated since 1759 in England, so its use by florists has a long pedigree. It has recently become rather trendy among celebrity and designer florists, even taking centre stage as the main flower focus of bouquets and arrangements. Trendy displays consisting of nothing more than gypsophila and a little foliage are very much in vogue at the moment, looking great as a table centre at a dinner party. It's true - the humble gypsophila has been given a new lease of life! Gypsophila paniculata 'Snowflake' is a pretty double-flowered baby’s breath that offers big airy clouds of white blooms in early summer. The flower panicles are strong-stemmed, compact and bloom a bit earlier than standard forms. Each stem has hundreds of tiny white flowers on wire-thin branches, giving an airy, soft impression. The flowers themselves are tiny; the plants are covered with myriads of white blossoms all during the summer. The flowers can be cut and dried and used during the winter months. The plants themselves are useful in the hardy border, or as pot plants. Easily grown from seed it blooms 6 weeks from the day it was sown. If you are short of space, broadcast seed in the bulb bed and it will do a great job of hiding their faded foliage in summer. Covent Garden also works very well in large containers. Given an early sowing, it will bloom from spring through to autumn. Sow it in succession every two weeks for lots of wonderful white flowers all summer. An early sowing indoors, 6 to 8 weeks before the last expected frosts will provide earlier flowers; otherwise, sow directly as soon as the ground can be worked in spring. Barely cover the seeds as they need light to germinate. When sowing directly where they are to flower, choose a sunny open site with good drainage. Prepare the ground well and rake to a fine tilth before sowing. Mark the sowing areas with a ring of light coloured sand and label if sowing more than one annual in the same bed. Surface sow in rows and barely cover. Seeds germinate in 7 to 18 days. The seedlings will appear in rows and can be told from nearby weed seedlings quite easily. Thin the seedlings out so they are finally 30cm (12in) apart by early summer. Pinch out the growing tip to encourage bushiness. Soil should not be too rich or you will get large plants with few flowers. Plain 'Top Soil' works best. Compost should be kept slightly moist, but not wet at all times. Do not fertilize, it will kill them. Once they are established they need little care. When the flowers are removed for use in arrangements, the plant, will blossom with renewed vigour. The plants don’t even need to be deadheaded. They will die back to the ground after the frost hits them, but will have seeded themselves for ready for the next year. Cottage/Informal Garden, Flowers Borders and Beds, Pots, Baskets and containers, Cut Flowers and Dried Flowers. As a cut-flower, assuming the water is kept clean; gypsophila is a relatively long-lasting flower, often out-living the other flowers in a bouquet. It also makes a nice dried flower, looking almost as good dried as it does when fresh from the florist. For bouquets, the day before you need them cut the stems in the late evening after the blossoms have opened. For longer lasting blooms: Carry a bucket of cool (not cold) water into the garden and immerse the stems immediately. Allow them to stand overnight in a cool, dark place to the harden stems before arranging the next day. For continual blooms: Leave 15 to 30cm (6 to 12in) of stem on the plant and cut just above a leaf joint so the plant will produce more blooms. You should be able to get three come backs during the entire season. The last ones that come up in late August should be left to re-seed for next year; or collect your own seeds from them. Whether you take it from your own garden or preserve the “filler” from an arrangement, simply hang it upside down in a warm, dry place. Once dried, the flower and leaves of baby’s breath look almost as vital as when they are fresh. Native to Eastern Europe, Asia and North Africa, most gypsophila species are found in calcium-rich soils, including gypsum, hence the name of the genus. A member of the Caryophyllaceae family, bizarrely it is related to the carnation, to which is bears no resemblance. Available to the florist year-round, gypsophila was first grown in the UK in 1759, and continues to be grown commercially here today. It is grown commercially on a large scale in Holland and Israel, and elsewhere in the world on a smaller scale. The specific epithet paniculata is taken from the Latin panicula meaning ‘with branched-racemose or cymose inflorescence’, ‘tufted’, ‘paniculate’, or ‘with panicles’. This name is in reference to the flowers of this species. It is commonly called baby's breath or simply Gyp, among the floral industry. Other names vary by locality and include Chalk Plant, Gauze Flower, Gypsy and Diamond Spray.